The name Permatech is synonymous with Precast Shapes. 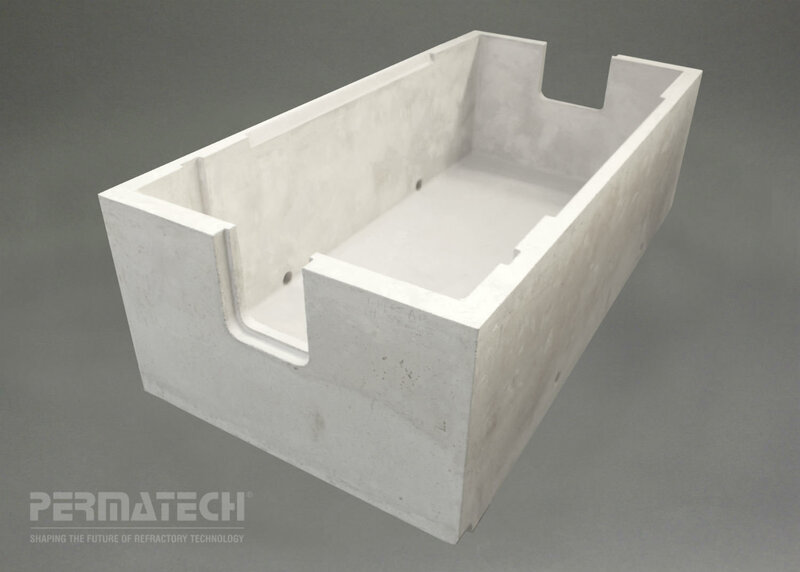 For over 25 years, Permatech has been recognized as the industry leader in the manufacture of precision precast pre-fired refractory shapes for the global aluminum industry. This distinction has been earned and will be maintained through a dedicated and disciplined approach to technology and manufacturing, and an ongoing commitment to understanding the needs and expectations of our customers. Permatech manufactures a comprehensive range of pre fired precast shapes for all aluminum cast-house applications, from the melting furnace to the continuous casting pit. Shapes range in size from as small as a few pounds with dimensions accurate to 0.005 inches, to as large as 9 tons with dimensions accurate to 0.1 inch. Only Permatech has the capability to manufacture pre fired crack-free 1-piece shapes of this magnitude. All shapes, regardless of size, are manufactured to exact customer requirements for refractory composition, dimensional tolerance, and surface cosmetics. Permatech manufactures a comprehensive range of pre fired precast shapes for aluminum automotive foundry applications. 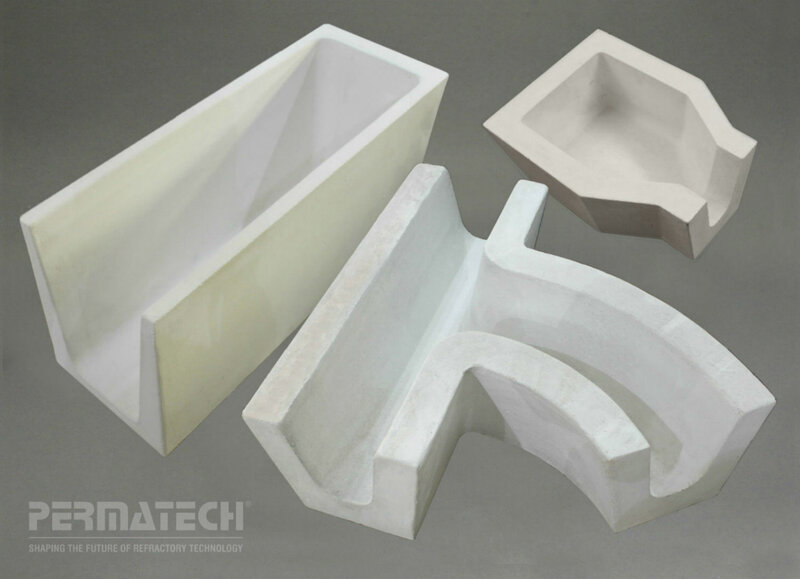 Permatech, Inc. has been recognized for many years as the premier supplier of intricate pre fired precast shapes to the global aluminum industry for cast-house applications. The PERMATECH ENGINEERING SERVICES TEAM is an industry leader in engineering the utilization of refractory shapes for aluminum Troughing ( Launder) Systems. Only PERMATECH has the necessary design, engineering and manufacturing expertise to build a Trough System that will conform to the specific assembly desired. Any size, shape or configuration is possible. Part of Permatech's small parts Line Trough Dams are custom designed and built to suit the needs of our customer. Our dams are cast from high quality Permatech refractory materials and then kiln fired, producing a hard durable part to fit your desired dimensions. 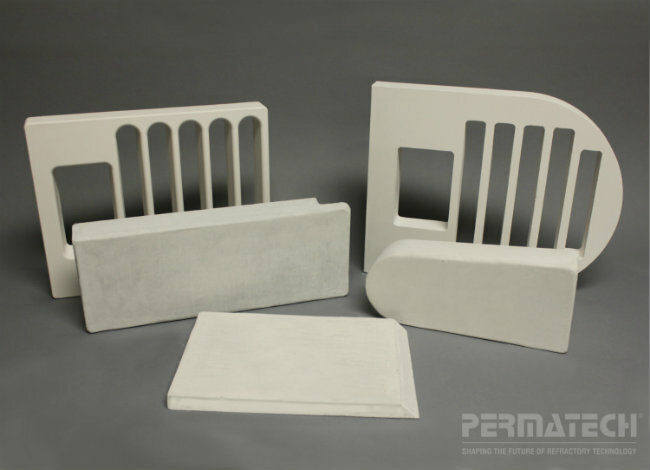 Permatech's refractory compositions are designed specifically to be used in molten aluminum applications. 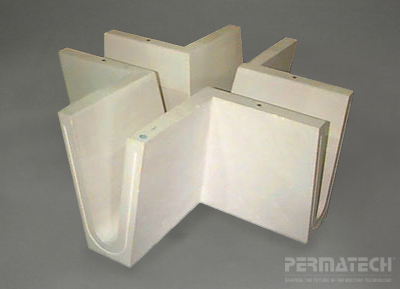 Permatech has the capabilities to manufacture 1- piece, pre-fired refractory liners as large as 10 tons in size. Our skilled technicians can repair your existing steel shell and install appropriate back up insulation. Downloadable files available for most of our product offering and services. Click the link below to acces the list of files available.